As periodontists, Dr. Weingarden and Dr. Bakuri are specifically trained to diagnose, treat and help prevent gum disease. Gum disease is an inflammation of the tissues and bones that surround your teeth. Gum disease, or periodontal disease (from perio “around” and dont “tooth”), is a common condition affecting millions of Americans. Periodontal disease is a “quiet” disease. Frequently, there are no symptoms, and patients are often surprised to learn that extensive damage can occur without them ever feeling pain or discomfort. When periodontal disease affects a dental implant, this is known as peri-implantitis, and requires specialized treatment. Periodontal disease is associated with several serious health conditions, such as diabetes, heart disease, stroke, osteoporosis, respiratory disease and cancer. It was thought that bacteria was the factor that linked periodontal disease to other disease in the body; however more recent research demonstrates that the link may have to do with inflammation. Therefore treating inflammation may not only help manage periodontal disease, but may also help manage other chronic inflammatory conditions. A pocket depth of 1-3 mm is healthy; pocket depths of 4 mm or more indicates an infection; pocket depths of 7 mm or more indicates a higher risk for permanent damage and tooth loss. The most common causes of periodontal disease are genetics, smoking and accumulated plaque bacteria. Plaque bacteria: Plaque is a sticky colorless film consisting of bacteria that continually forms on our teeth, and if not removed by brushing and flossing, can form a hard buildup of tartar. This buildup irritates the gums, causing them to become inflamed and retract from the bacteria and the teeth. Tartar (calculus): This hardened plaque lurks below the gum line, and if not removed, accumulates more plaque and causes loss of bone and tissue support around the tooth. Poor diet: Lack of proper nutrition may cause chronic adverse conditions, including gum disease. A well balanced diet featuring fresh fruits and vegetables can boost nutritional levels. Genetics: An estimated 50% of people are predisposed to gum disease. However, proper oral can keep the disease at bay. Systemic diseases: Certain systemic diseases may contribute to periodontitis, including diabetes, respiratory disease, heart disease, and autoimmune disorders. Smoking: A recent study indicates that the most damaging types of bacteria are found in the mouths of smokers. Low quality dentistry: Ill-fitting bridges and crowns may accumulate bacteria beneath their surfaces. Periodontitis causes the gums to separate from the teeth leaving “pockets.” A pocket depth of 7mm or more is indicative of severe gum and poses the potential for permanent damage. The deep pockets trap food and plaque, become irritated and infected, and damage surrounding gum tissue and bone. In the last stages of periodontitis, bone and connective tissue have diminished to the point that they can no longer support a tooth. The tooth will become loose and may need to be extracted. In some cases, we use a simple saliva DNA test to determine the specific type and quantity of bacteria in your mouth. This technology allows us to precisely diagnosis the exact strain of bacteria that are present and prescribe the appropriate antibiotic. The DNA saliva test can also show if you are resistant to a particular type of antibiotic. Signs of gum disease include gums that are pulling away from teeth, redness and swelling. 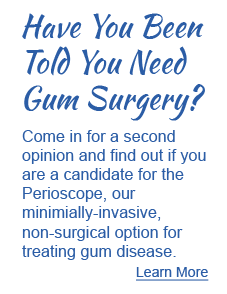 As part of your treatment, we offer comprehensive education on preventing gum disease from recurring. Learn more about preventing gum disease. Oral pathology pertains to diseases of the mouth. Our doctors provide screening for oral cancer and other signs of disease during your examinations. The inside of the mouth is normally lined with a special type of skin (mucosa) that is smooth and coral in color, and any changes in this appearance could be a warning sign that a disease is present. The most serious pathology is oral cancer. These changes can be detected on the lips, cheeks, palate, and gum tissue around the teeth, tongue, face and/or neck. Diseases of the mouth don’t always produce painful symptoms, and, oddly enough, oral cancer is not usually painful. However, if you have facial and/or oral pain without an obvious cause or reason, you should be examined immediately. An oral cancer screening is conducted during every cleaning appointment in our office. Remember, your mouth is one of your body’s most important warning systems. Please do not ignore suspicious lumps or sores!